It was fun in the beginning but now reporting a new version of Firefox has become as mundane as telling the time. 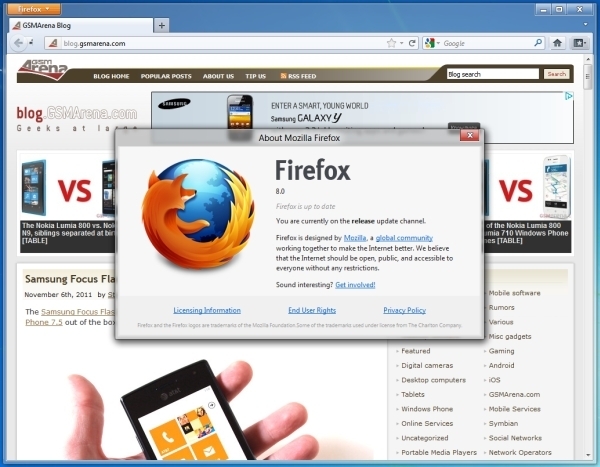 Just a few weeks after Firefox 7 came out Mozilla has now released Firefox 8. But this isn’t an official release yet. The official launch is slated for November 8 but keeping with their tradition Mozilla has provided the Firefox release on their FTP servers a couple of days before. As for the changes in the new version, there is nothing noteworthy about any of them. You can find the list below. If you don’t want to wait till tomorrow to get the update officially, you can download it for your respective system from the links below (US English version).